I went with the pinless method and used my walking foot nice and slowly. That was the tortuous bit really, not being able to whizz along like I normally do lol I think I did pretty well as regards getting things lined up. I had the occasional 1/8th of an inch of the white showing, but to be honest the templates were a bit slippy, so it’s perfectly possibly those outers were slightly too big to start with, as I seemed to get more movement when cutting them. Now I need to cut the centre squares down to size, and then I see a lot of chain stitching in my future as I make up the flowers. 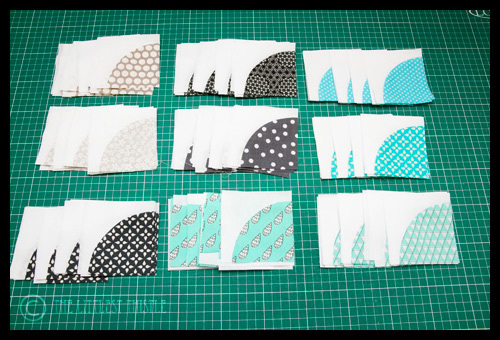 Tomorrow I’ll be starting to cut into my olive and coral Prince Charming FQs to get started on my first My Precious quilt. I’ve decided that the smallest 2 circle sizes will be solid fabric, and the ones 4 1/2″ and above will be both pieced and paper pieced to create the taffy effect. I just chose 3 of the 5 styles to replicate, as 2 were really quite thin slivers, and I didn’t think it would show any of the fabric off to its advantage. Wish me luck! It looks great to me. Can't wait to see when it's all done. I don't think you need good wishes ;)), but here goes WISHING YOU LUCK! I like the colours of your flowers, pinless piecing seems very brave. Good luck with your Precious Quilt, it sounds challenging! Your choice of prints are looking great! They will make fab flowers! Retro girl! have fun chain stitching friend! Good luck! I'd love to do this Retro Flowers QAL but secretly I'm glad I'm too busy as the thought of sewing curves scares me! Have fun with Prince Charming! I love the colours you have chosen for this quilt. I was going to say 'bloody hell, that's good going' then realised you are ONLY doing 9 flowers! Just nodding and smiling at the Precious idea – you could be speaking Swedish! Oooh looking brilliant! I love your fabric choices. Looking good Katy but you have the stop the teasing now! Looking good! You are making great progress! Ooh, those are so pretty! I love the aqua and grey! Love the colours for the retro flower. Pinless – you say – genius – look great already. pretty petals!! Ok you are a machine!! You work so fast – I find pinless much easier too.